It's been a very TouchPad-world in our forums these last few days, with tutorials, reviews, tips and complaints popping up in all of the usual ways through thousands of threads by nearly as many community members. Here's a look at four threads from today that we think are particularly interesting for the world to know about, and we invite you to click through to take part in the discussions. Registration is completely free and open to all, so why not take a few seconds to join in the discussions over there? If you have a discussion you want to share with the rest of the world, we'd like to put it on our homepage, too. 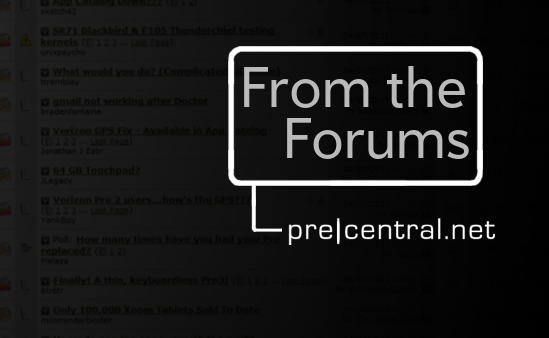 Send an email to tim@precentral.net and we'll add it in with the next "From the Forums" article later in the week. Did you ever think you'd see the day when HP employees would openly join a conversation in our community forums to gather feedback from users? Well, NatalieFromHP is a newcomer to the list of members, but as her name says clearly, she comes to us directly from HP to talk with real consumers and read what people are saying about webOS devices. We aren't sure how long she'll be sticking around or how many discussions she'll get into, but we love the idea that HP representatives are reading through our forums to get in with the people. If you've been concerned with the battery life of the TouchPad, several of our members have decided to help ease your mind a bit and share their experiences. From the amount of use these devices get from our users, you might expect the battery to be cold and dead by the end of the day, but as these users share, that hasn't been the case for them at all. And of course, if you're able to get a TouchStone, the issue of a dying battery should be even less of a concern. At least, that's what our experience shows. With a few more than 300 great apps currently available in the TouchPad app catalog (and plenty more coming), there is still a lot of room for growth. App Developer dmglakewood wants to encourage that growth in his own way, and is actually asking users to submit their TouchPad app requests for him to get started on. Got an idea for an app you'd like to see built? Send them his way. Sure, we already took a look at Beats Audio Technology as it works on the TouchPad, but as is usually the case, we want to know what our users think about the features from real-world experiences. To brdl04, Beats Audio is "legit" and impressive, even if the speakers do cause some muffling when placed on certain surfaces. If you've had a chance to try out Beats Audio for yourself on the TouchPad, you should share your experiences as well, the thread is growing quickly, and more voices are always welcomed to be heard (as clearly and noise-free as possible).